The village, which is believed to be the place where the last rites of Sambhaji Maharaj were conducted after he was killed by Mughal Emperor Aurangzeb, is at the centre of a dispute that partially triggered the violence in Koregaon Bhima in January 2018. 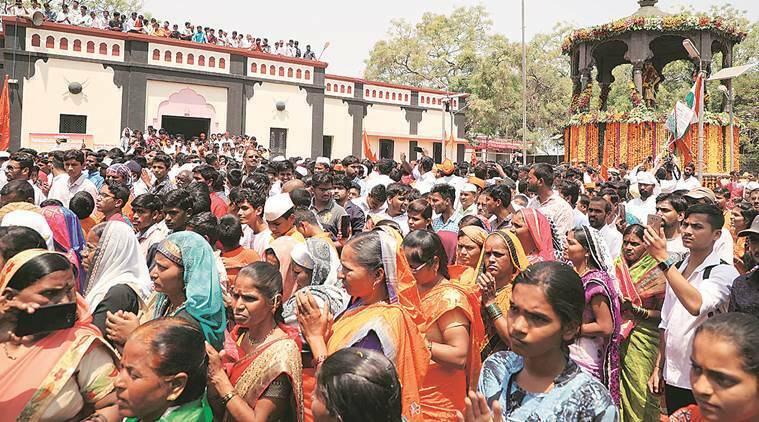 Amid massive police presence, thousands of people gathered at the village of Vadhu Budruk on Friday for the 330th death anniversary of Chhatrapati Sambhaji Maharaj. Among the attendees were Shivajirao Adhalrao Patil, the sitting Shiv Sena MP from Shirur who is contesting the Lok Sabha elections, and actor Amol Kolhe, who is playing the role of Sambhaji Maharaj in a Marathi television serial and is also contesting from the Shirur constituency as a candidate of the Nationalist Congress Party (NCP). 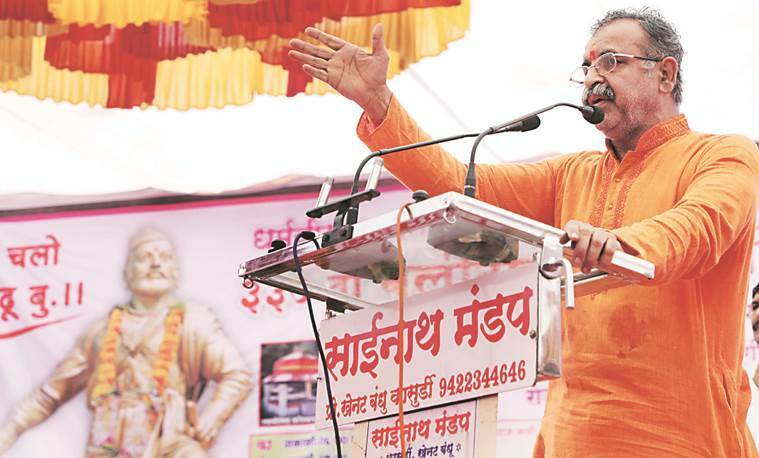 Hindutva leader Milind Ekbote, an accused in the Koregaon Bhima violence case who is out on bail, was also present at the programme, organised by the Dharmaveer Sambhaji Maharaj Smruti Samiti, an organisation he has long been part of. In his speech, Ekbote narrated incidents from the life of Sambhaji Maharaj. He also announced an award — the Dharmaveer Chhatrapati Sambhaji Maharaj Mrutyunjay Puraskar — for Wing Commander Abhinandan Vardhaman, the Indian Air Force (IAF) pilot who was held captive by Pakistan after the Pulwama terror attack on February 14 and later released. “We contacted the brave IAF officer’s father through retired Air Marshal Bhushan Gokhale. He was unable to come to receive the award today. But it is a great moment for us that we are honouring him with an award in the name of Chhatrapati Sambhaji Maharaj,” said Ekbote. Vadhu Budruk is known for the samadhis of Sambhaji and his close lieutenant Kavi Kalash, who were killed by Mughal Emperor Aurangzeb in 1689. However, there is a dispute over who conducted Sambhaji Maharaj’s last rites. The Marathas believe it was their ancestors, the Shivale Deshmukhs, who defied Aurangzeb’s orders and performed the last rites. The samadhis of the Shivale Deshmukhs also exists in the village and is in the records of the gram panchayat. But according to the Dalit narrative, particularly of the Ambedkarites, the last rites were performed by Govind Gopal Mahar, a 17th century Dalit figure. The samadhi of Govind Gopal is located in Vadhu Budruk, but is not in the records of the gram panchayat. On Friday, the samadhi of the Shivale Deshmukhs was decorated with an arch stating “Veer Bapuji Shivale Smarak”, but no activity or official government programme was conducted at the Govind Gopal Samadhi. District Collector Naval Kishor Ram conducted the official government programme at the samadhi of Sambhaji Maharaj along with Superintendent of Pune Rural Police Sandip Patil on Friday morning. District Guardian Minister Girish Bapat, and MLAs Baburao Pacharne and Sharad Sonawane were also present. Pandurang Balkawade, a historian, Marathi TV actors, members of different groups and Hindutva outfits across the state were also present. 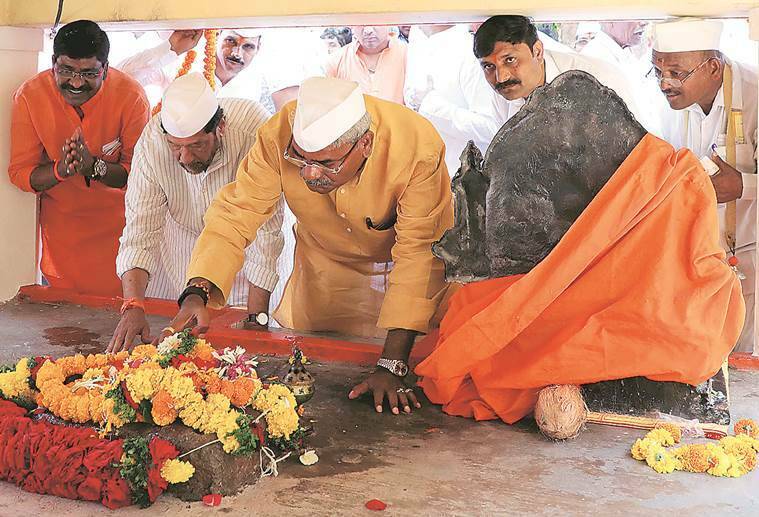 Programmes to mark Sambhaji’s death anniversary were also held at Tulapur village — also known for a memorial of the Maratha king — few kilometers away from Vadhu Budruk. Over the last few years, the number of people, mainly Ambedkarites, visiting Govind Gopal’s samadhi in Vadhu Budruk after visiting the ‘Jaystambh’ in Perne village to mark the anniversary of the Battle of Bhima Koregaon, has increased significantly. Reportedly, the number of visitors for the Sambhaji Maharaj Balidan Smaran Din (death anniversary) programme at Vadhu Budruk is also increasing. A board with the disputed history about Govind Gopal erected by the Dalit community in Vadhu Budruk on the intervening night of December 28 and 29, 2017, was removed by members of the Maratha community, leading to an altercation that is seen as one of the triggers for the violence on January 1, 2018, in which one person died and several others were injured.